Ryan should benefit from offseason improvements along the offensive line in 2019, the Falcons' official site reports. Ryan (wrist) may be afforded more time to throw in 2019 after Atlanta agreed to contracts Wednesday with free-agent guards James Carpenter and Jamon Brown. Ryan (wrist) said that winning a Super Bowl title is what "motivates (him) to get out of bed every morning," Vaughn McClure of ESPN.com reports. "It's the No. 1 goal for me," Ryan stressed. "To bring a championship to this city and to our organization, that's what it's all about." 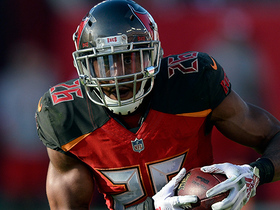 Ryan relayed Thursday that a left wrist issue which cropped up Week 17 led to him opting out of an opportunity to go to the Pro Bowl as an alternate, Vaughn McClure of ESPN.com reports. Analysis: As a result, Mitchell Trubisky got the Pro Bowl nod, but Ryan indicated that his wrist issue is not a concern at this stage. 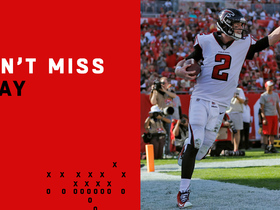 With the offseason ahead to rest his aches and pains, Ryan should be fine by the time the Falcons take the field again. 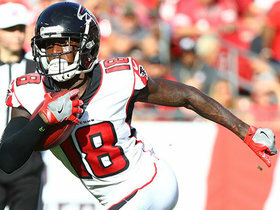 At that time, he'll look to rebuild his chemistry with a skill-position corps that is slated to welcome back its key cogs, though possibly minus running back Tevin Coleman, who is eligible to become an unrestricted free agent in March. 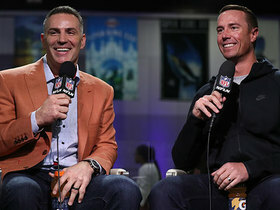 Ryan will receive play calls from Dirk Koetter in 2019 after the former Buccaneers head coach was named Atlanta's offensive coordinator Tuesday. 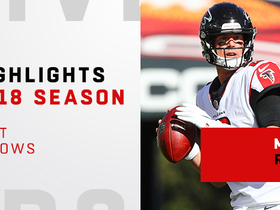 Ryan completed 31 of 44 passes for 378 yards with two touchdowns and one interception in the Falcons' 34-32 win over the Buccaneers on Sunday. He also rushed four times for seven yards and caught a five-yard touchdown pass from Mohamed Sanu on a trick play. Ryan completed 15 of 26 pass attempts for 239 yards and three touchdowns during Sunday's 24-10 win over the Panthers. He also lost a fumble. Ryan completed 22 of 36 passes for 231 yards and two touchdowns during Sunday's 40-14 win over Arizona. He added 18 yards and a touchdown on three carries. Ryan completed 28 of 42 passes for 262 yards with three touchdowns and an interception in Sunday's 34-20 loss to the Packers. Analysis: Ryan's overall statline is solid enough, but he salvaged a relatively poor afternoon with a pair of fourth-quarter touchdowns. The veteran quarterback's sixth interception of the season was a costly one, as Bashaud Breeland jumped an Austin Hooper out route for a pick-six in the second quarter to help the Packers eventually build a 34-7 lead. Ryan and the Falcons have now lost five straight games as they get set to host the Cardinals in Week 15. Ryan completed 16 of 26 passes for 131 yards and a touchdown during Sunday's 26-16 loss to Baltimore. He lost a fumble during the contest and it was returned for a touchdown. Ryan completed 35 of 47 attempts for 377 yards, with two touchdowns, an interception and a lost fumble, adding two rushes for 16 yards during Thursday's 31-17 loss to New Orleans. Ryan completed 24 of 34 pass attempts for 291 yards, one touchdown and one interception during Sunday's 22-19 loss to the Cowboys. Ryan connected on 38 of 52 passes for 330 yards and two touchdowns while rushing three times for 13 yards and losing one of two fumbles in Sunday's 28-16 loss to the Browns. 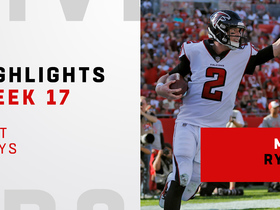 Analysis: Ryan linked up with Julio Jones for a one-yard touchdown in the second quarter, but he failed to convert on a crucial fourth down from the Cleveland 1-yard line down 28-10 in the fourth. Faced with almost the same exact scenario on the next drive, Ryan found Austin Hooper for a three-yard touchdown. His fantasy performance was probably better than his real-life impact, but Ryan's owners should be just fine with that. Atlanta will host the Cowboys in Week 11. Ryan spoke glowingly of the Browns defense following practice Wednesday, D. Orlando Ledbetter of The Atlanta Journal-Constitution reports. "I think they've done a good job in the secondary of making plays and coming up with interceptions," Ryan said. "I've been impressed by what I've seen from them on film." Ryan completed 26 of 38 passes for 350 yards, four touchdowns and an interception during Sunday's 38-14 win over Washington. 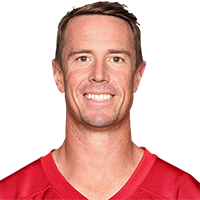 Atlanta Falcons quarterback Matt Ryan joins "NFL Total Access" and discusses how the Super Bowl LI loss is "a constant motivator". 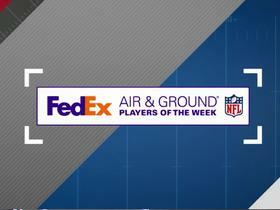 Check out the Week 17 nominees for FedEx Air and Ground Players of the week. 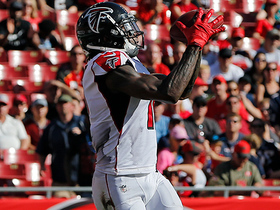 Atlanta Falcons quarterback Matt Ryan launches 37-yard pass to wide receiver Julio Jones. 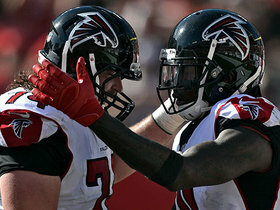 Atlanta Falcons quarterback Matt Ryan delivers 19-yard touchdown to wide receiver Julio Jones. 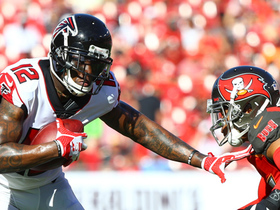 Atlanta Falcons wide receiver Mohamed Sanu runs after catch for first down.